SOEKS Ecovisor F4 5-in-1: Geiger Counter, Dosimeter, Nitrate Tester, EMF Meter, Water Quality Detector- English Version. Buy from official distributor Securitylab: English version,manual and Sydney stock. SOEKS Ecovisor F4 is the latest home-based laboratory which has 4 functions in a single device. The SOEKS Company develop this amazing device to protect your family’s health. You can easily and quickly check the food quality by using this Ecovisor. The only thing you need to do is select the product from the list. 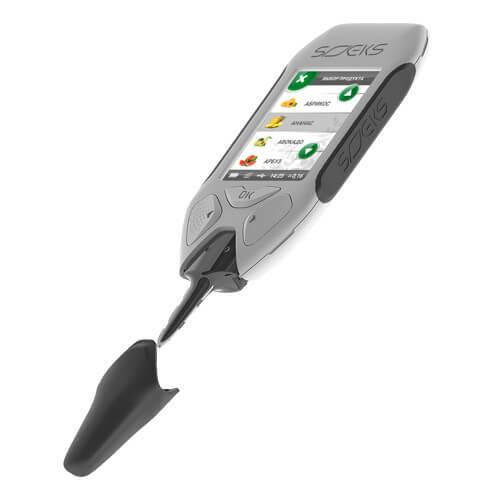 The limits of the nitrate levels are stored in SOEKS Ecovisor’s memory. It will generate the digital and graphic warnings if the limits are exceeded. Ecovisor F4 has the in-build dosimeter. It helps to find out the background radiation level of food products, waters, and other things. Once Ecovisor SOEKS activates it detects the radiation and monitors the accumulated dose continuously. If the Ecovisor’s in-build Dosimeter detects the radiation dose exceeds the limits, Ecovisor F4 will give the alert to your health. Water is the necessary thing in our body. But some contaminated water causes severe health issues. To avoid this health issues, you can use the SOEKS Ecovisor to find out the quality of the water. The electrical devices in our surroundings will emit the electromagnetic rays. The in-built electric and magnetic field sensors in SOEKS Ecovisor help you to detect these rays. • Geiger counter – measures radiation and alerts ionization radiation in food, air, water, objects etc. • Dosimeter – track the radiation dose and alerts when certain levels are reached based on the pre-programmed or user-selected levels. • Food Nitrate Tester – check the number of nitrates found in fruits, vegetables, meats etc. • EMF Meter – test the EMF’s rays in your house, environment, electronic devices.